My favorite Greek restaurant on the planet (so far anyway) is Kokkari in San Francisco Ca. Great place with a traditional foundation but with chefs that fuse tradition with farm and sea to table menus, and modern cooking techniques. 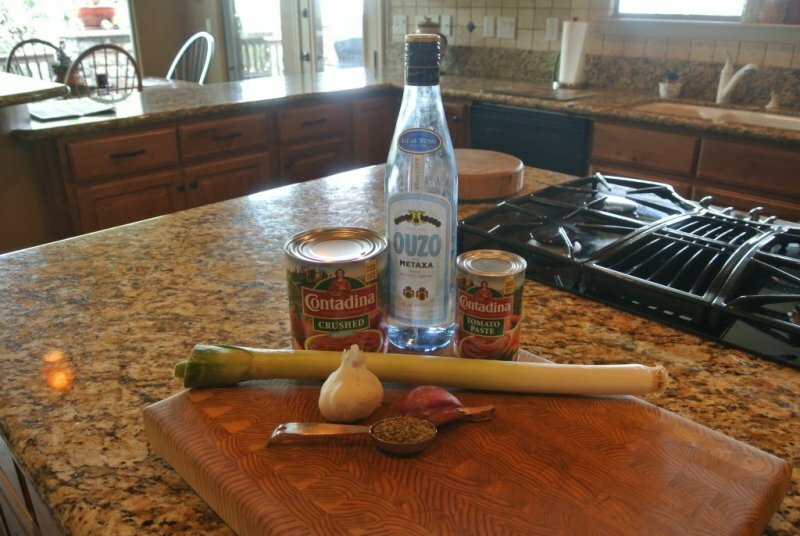 I am calling today's cook Greek / Italian fusion Catch of the Day. In actuality. it is my attempt to knock off Evvia's fresh fish lunch special . Evvia is the sister of the head chef and owner of Kokkari and has a sister resturant called Evvia's, and I had this dish at her restaurant one delightful afternoon. 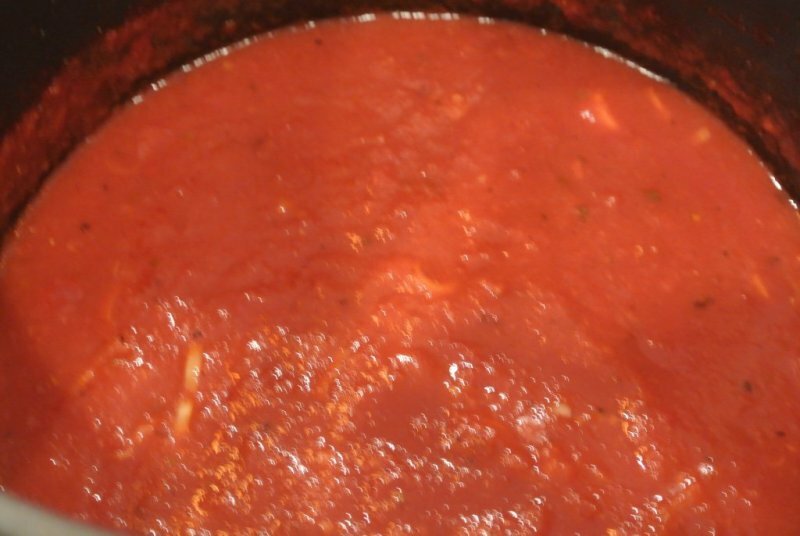 Start the tomato sauce with the oil in a pot, when hot, add the garlic cloves, and tilt the pot while still on the fire so the cloves are covered. 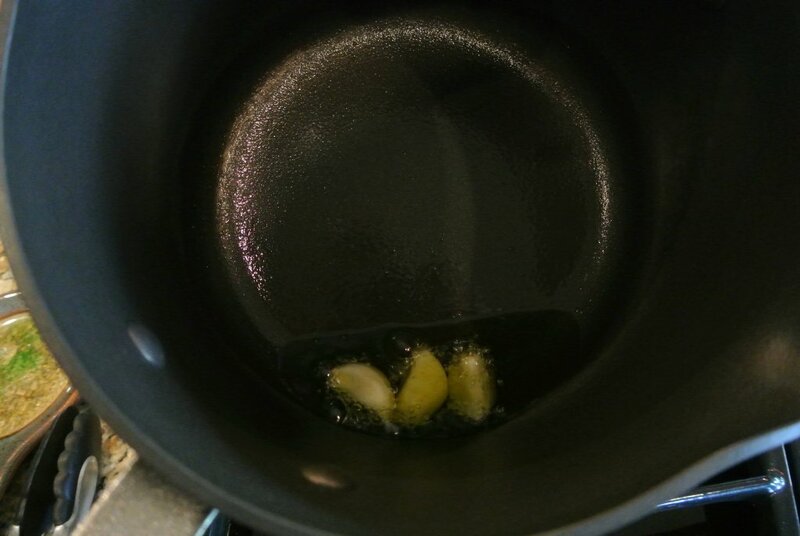 cook until golden brown, and then remove the cloves, retaining the oil. Add the tomatoes and Tomato paste. Add the oregano and float the basil sprig. Add sea salt as desired. Let this cook while you prepare the fish prep. 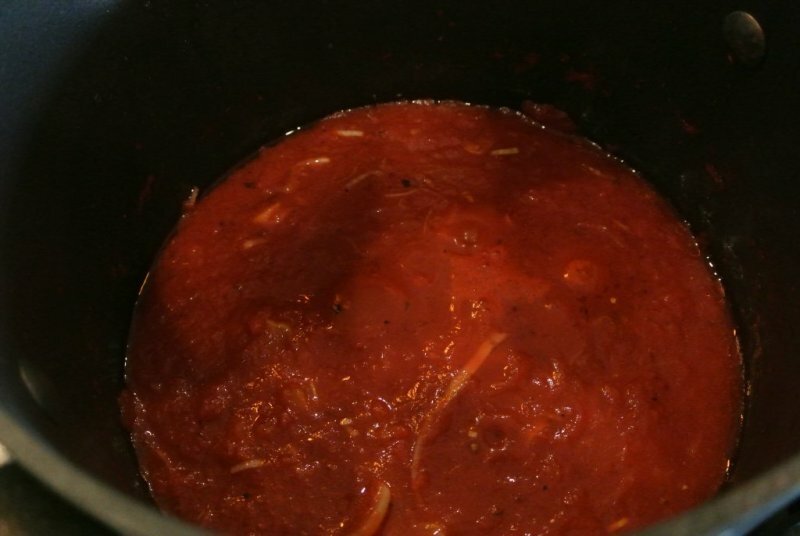 When the tomato sauce has cooked about 20 min, add the leak, shallot, Ouzo and chicken broth. 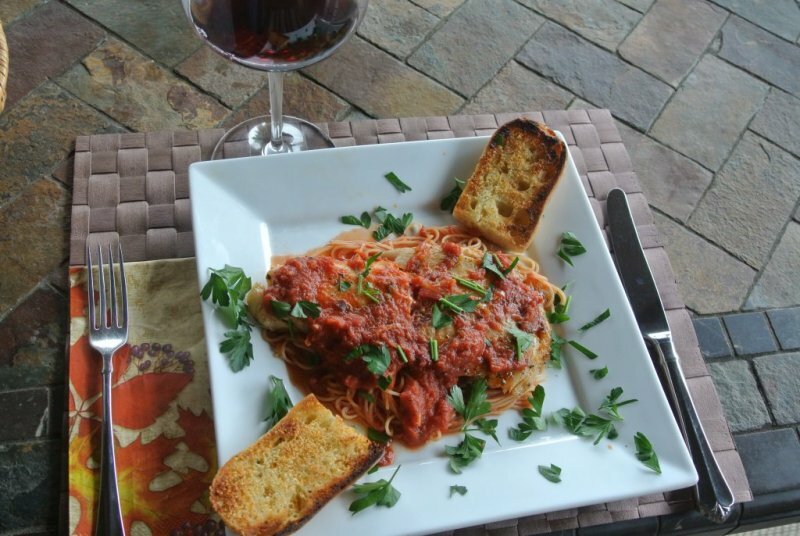 Evvia says you just need to cook it about 40 minutes, but it smells so good I usually simmer it all afternoon, as I prep the fish. 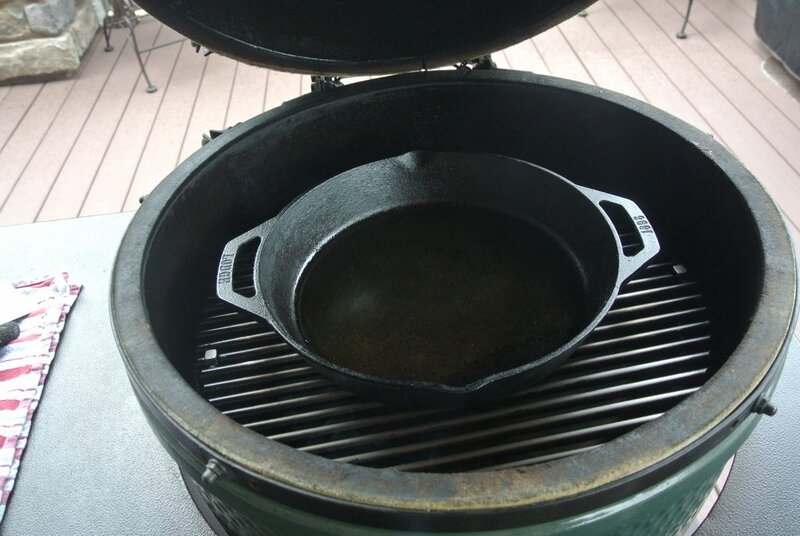 I used a 12" double handled Lodge cast iron pan on the main grate of my Egg. 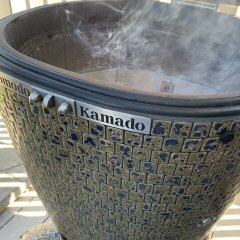 I use a diffuser, but on a repeat cook would probably go direct for a bit more heat. I let the Egg hit 500 degree before I put on the fish. 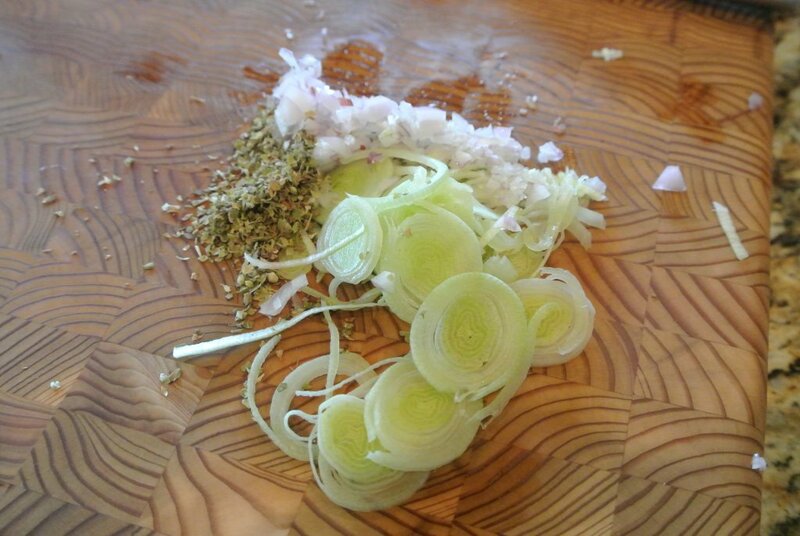 The Talipa prepped with olive oil, garlic, smoked Spanish paprika and minced basil. 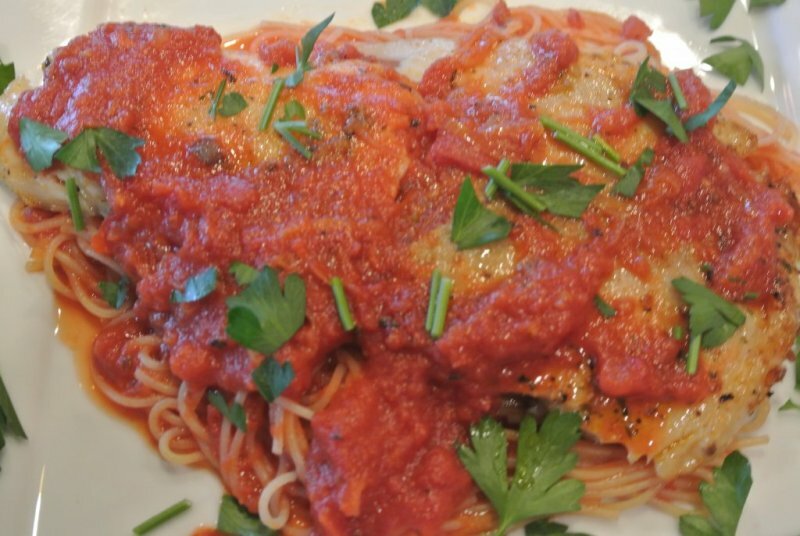 After the fish is gone, Go back in the kitchen, get that last piece of garlic bread and spoon a pool of sauce in the middle of your plate, then return to the table, I am confident that you can figure out the rest. 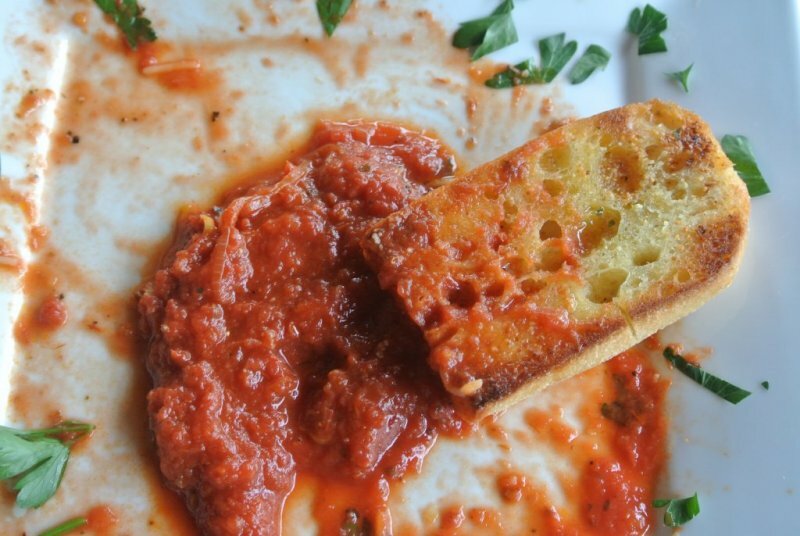 Truly a simple sauce yet with complex flavors and not requiring much work. Really delicious. Ps. my wife makes the best garlic bread I have ever tasted. I have made this dish with Salmon, Stripped Bass, Cod, Halibut, Sword Fish, and Corbina. It works well with any flakey fish. I actually intended to enter the challenge but just couldn't find the time to cook on Sunday. Anyway, you get the idea and all's good. Gorgeous dish and outstanding detail in the post. Absolutely amazing. Would have made a spectacular entry! I totally agree, would have made an awesome entry. 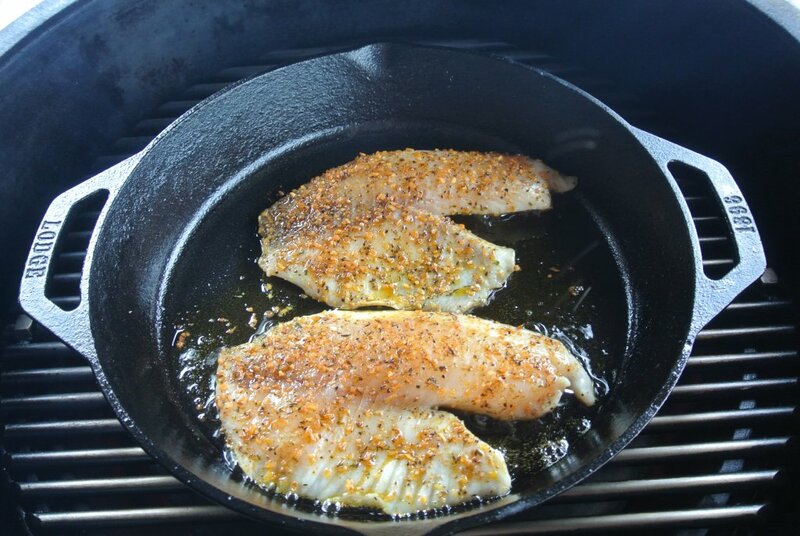 Great looking fish cook using that yukky talipia (j/k I like talipia when cooked right). When you get a nice light crust on Talipia and keep the IT around 120 it actually is pretty good. When you over cook it, I agree it tastes a bit like cardboard. Here it is done right, just a little golden crust, flakey, and moist. Have to admit though, the sauce is so flavorful, it might make cardboard taste pretty good. Excellent job, great photography, looks delicious. A winner for sure. It's fun being able to replicate a dish you like from a good restaurant (though nowadays Mrs lunchman prefers anything I make to most restaurants). I'm sure that's true of most folks posting on this forum. Totally agree. Like I said in the other thread "Don't blame the fish, blame the cook." but that's how it goes with most food. Yup, I certainly agree with that. There is a big difference between just combining ingredients and really cooking. 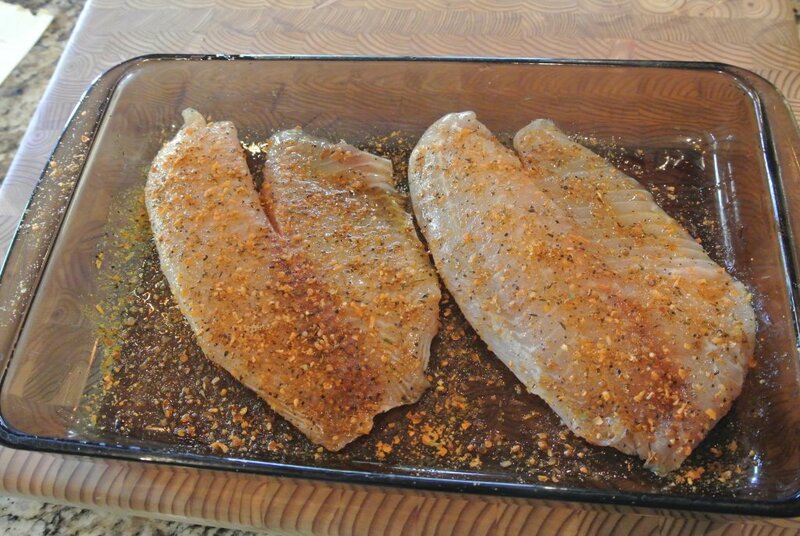 Fish and poultry both have very small margins for error and are really easy to over cook. 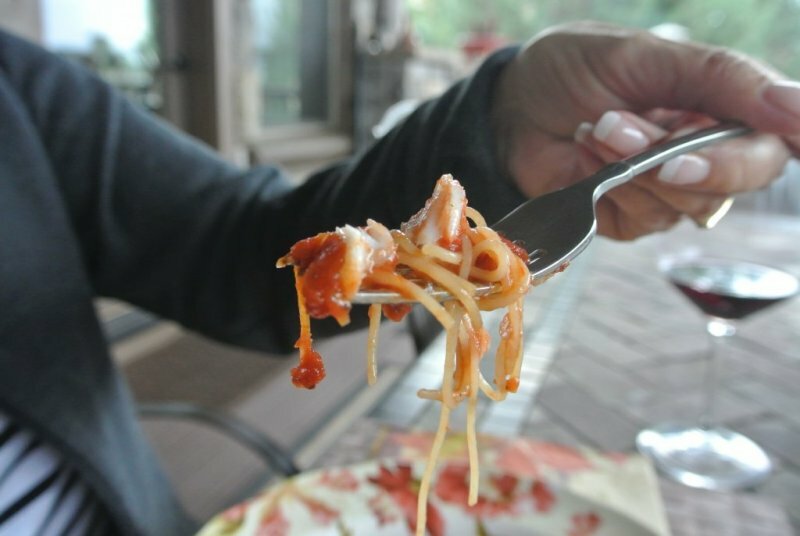 Also any sauce you use needs to enhance the delicate flavor, not cover it up. One of the reasons I like this sauce is that the Anise flavor of the Ouso is perfect for white fleshed fish. Never knew that before I had this dish. top notch thread right here sir. cant wait to try it.